Click on the “Get Directions” link on the above map to find your way to your new home. COME HOME TO PLAY. 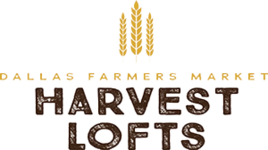 Harvest Lofts is located right next door to the newly revamped Dallas Farmers Market with farm-fresh produce and artisanal offerings and in downtown Dallas loaded with places to play—five-star restaurants or a relaxed Saturday morning breakfast at a favorite diner, formal cultural events in the Dallas Arts District, an outdoor movie at Pegasus Park or the Nasher Sculpture Center Lawn, or an after-work jog through the West End. Downtown offers high-profile clubs full of the young and vibrant and relaxed hangouts introducing talented local musicians. From Harvest Lofts, it’s a two-minute DART ride to American Airlines Center to watch the Mavs or Stars.